To get started planning an event with Dynamics 365 for Marketing, you start by creating an event record, which collects all of your planning details, gives links to related records, and provides a business-process timeline that helps guide you through each step of the event-planning process. Then you set up your event team, manage speakers and sessions, set up event passes, and set up a venue. The first thing you'll do when setting up your event in Dynamics 365 is to set up an event record. Everything that you do related to a given event will either be stored directly in the event record itself, or stored in other records that are linked to that event. Though the solution offers many different views into other record types, you'll probably do most of your work directly in the relevant event record because you'll be able to view and create most types of related records from here, and everything that you do will automatically be related to that event. You can see a list of all your event records by opening the Events work area and going to Events > Event > Events. From here you can use the standard list-view controls to search, sort, and filter the list to find and open an existing event, or to create a new event record. If you often run similar events, then you can save time by setting up one or more event templates and then choosing an appropriate template when you first create a new event. 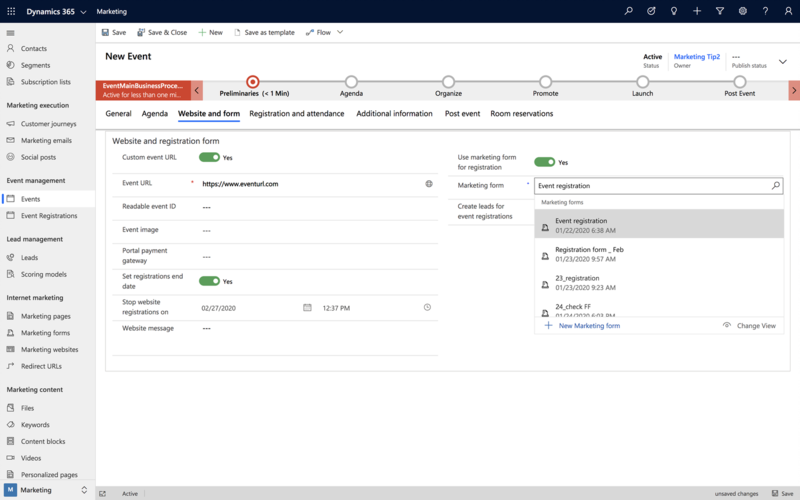 As with many other forms in Dynamics 365, the event form provides a summary of its most important settings at the top, where you'll also find the business workflow timeline, which helps organize your work at each stage of the event-management process. A standard business workflow for events is provided out of the box, but you can customize it to match the process in place at your organization. The first time you create a new event, you must specify values for each of the required fields (marked with a red asterisk), and we recommend that you fill out the business-critical fields, too (marked with a blue plus sign). All required and business-critical fields are available at the top of the page in the business workflow, where you can fill them out quickly and easily. All settings that you enter in the business workflow will also be visible among the other event details farther down the page. You'll still be able to see and edit these settings even after you move forward to the next stage in the workflow. After you enter values for all the required fields, you can save the record. You'll probably return to the event record many times over several days while you plan your event. Use the workflow as a to-do list and to track your progress during each stage. The main body of the page repeats all the important information requested by, and shown in, the workflow, plus much more. It's organized into tabs, which you can navigate by using the links provided near the top of the page body. You can enter your planning details in the main body of the page whenever you want to—you don't have to wait until you get to a specific part of the workflow. See the following subsections for a summary of how to use each available tab. Only live events, sessions, and tracks are shown on the event website. When you're ready to go live with an event, session, or track, open the relevant record and set its Publish status to live. Contacts will then be able to visit your event website, read about the event, and register online. Event type: Choose which type of event this is. This is for information only and won't affect any features. Use it to make your event easier to find and identify. Format Set up your event as a webinar, webinar simulcast, or on-site only. Registration count: Shows the number of people who registered for the event. Check-in count: Shows the number of attendees that checked in during the event. Custom event URL: If you are hosting your event website on your own server, or in a custom location of your Dynamics 365 portals solution, then select this check box and edith the Event URL as needed. Readable event ID: This is a unique ID for the event. It is generated the first time you save the event, and is based on the event name. This becomes part of the URL for opening the event website to a particular event. Enable CAPTCHA: Set this to Yes to include a CAPTCHA on the registration page of your event website. Set this to No to disable the CAPTCHA. Portal payment gateway: To enable online payment during online event registration, set up an account with a third-party online payment provider and then prepare a payment page on your portal according to their instructions. Then choose that page here. This setting only has an effect for event websites hosted on the Dynamics 365 portal (it has no effect on externally hosted event websites). Enable multi-attendee registration: Set this to Yes to allow users of the event website to register several attendees at once. Set to No to allow just one attendee per registration. Event image: Choose a banner image to show on the event website when browsing this event. You can choose any image that is already uploaded to your file library, or upload a new one from here. Allow anonymous registrations: Controls whether contacts can freely register themselves for an event on the event website, or if they must first set up an account with a user name and password. Contacts who create an account have several advantages including: the ability to register any number of attendees and the ability to return to view schedules or edit their registrations at any time. This setting only has an effect for event websites hosted on the Dynamics 365 portal (it has no effect on externally hosted event websites). Schedule: Provides settings for specifying the time zone, start, and end dates for your event. You can also set up a recurring event here. Note that if you change the start date for an event that's already been saved, you'll be asked whether you want to change the end date and the session schedule to match it. Timeline: As with most types of entities in Dynamics 365 for Customer Engagement, you can use this section to build a record of the activities (such as calls, emails, and appointments) that you and others do in relation to the current record. You can also share notes here. Use the links, buttons, and menus at the top of this area to create new items and to search and sort the list. Location: Specify the location where your event will take place. The location is hierarchical, and you can specify only as much detail as you need. For example, you can specify just a building, but to specify a room, you must first choose the building that contains that room. You'll also be able to assign a separate location to each session if applicable. You can create location records from here, or choose from among existing venue records. Each location record can hold useful information such as address, facilities, capacity, and more. Venue constraints: This section only appears for on-site events. Each time you set a new Location, the Maximum event capacity value shown here updates to match the capacity configured for your last selected building, room, or layout (if available); you can then edit the value manually to override this if needed. You can also enable the waitlist here to handle registrations that arrive after the event is full. Waitlist: This section only appears if you enable the waitlist in the Venue constraints section. Use it to configure options for how to invite waiting contacts when space becomes available. Webinar setup: This section only appears for webinar and hybrid events. Use the settings here to set up your webinar configuration and find the URLs for viewing and presenting the webinar. When this is set to Yes, the website offers session-level registration. When a registrant selects Register now, the event website shows a list of all of the available sessions, and the registrant can add one, some, or all of them as needed. This option only works for events where registration is free (without online payment). With this option, passes won't be presented for selection during checkout. When this is set to No, the website offers event-level registration. When a registrant selects Register now, the event website shows a list of passes available, each of which provides access to one or more specific sessions and can also show a different price. Registrants can choose the pass that best matches their needs, but can't make custom session selections. This option works for both free and paid passes and events. Sessions: Each session is typically a single presentation, class, discussion, or webinar. Tracks: Each (external) track is a collection of related, non-conflicting sessions that likely would be of interest to the same audience. Attendees might sign up for a specific track, which you can manage by using passes. You can also set up internal tracks, which are not exposed to attendees but can help you with your planning. Speaker engagements: Each speaker engagement maps a speaker to a session occurring at your event. Sponsors: Companies who are sponsoring the event. Passes: View and create types of passes, which function as tickets to your events, sessions, and tracks. Event custom registration fields: Here you can view and create custom registration fields, which enable registrants to provide extra information (such as dietary restrictions or gift options) when they register for the event. Event registrations: This table provides a list of people who registered for your event. You can also register people manually here. If you are using custom registration fields, then you can also view the values submitted by each attendee here. Event check-ins: Here you can see who attended the event and enter attendance records. Waitlist: See who's on the waitlist for this event. Contacts who canceled: Lists contacts who were registered for the event but who have now cancelled their registration. The list includes cancellations made by contacts using the event website and by users using the Marketing app. If you'd like to communicate with contacts who cancelled from one or more events, you can set up an interaction segment based on EventRegistrationCancelled interactions and then use that segment to target a customer journey. Additional information: Enter a basic description and outline your goals. Financials: View and record financial details for your event. These values appear in dashboard charts and analytics, but are intended for information only, not for formal accounting or bookkeeping. Event team members: Set up your event team by adding links to coworkers and external contacts who are helping you organize the event. The table here shows each team member's name and role, so you can easily see who to call and find their contact info when needed. Here you can view and create online surveys related to your event. You'd typically use this to collect attendee opinions about how it went. A second table provides links to individual survey responses. Surveys are provided by the Voice of the Customer feature. Your event team includes coworkers and external contacts who are helping you organize the event. Each event record lists each team member's name and role, plus links for more information, so you can easily see who to call and find their contact info when needed. You can view and edit the list of all team members who worked, are working, or will work on all your events by going to Events > Event > Event Team Members. Use this area to set up a database of people who are available to help with your various events. You can view and edit the list of team members associated with a specific event by going to Events > Event > Events, opening the appropriate event, and looking at the Event Team Members section of the Additional information tab. The list on the Events page works the same as the list on the Event Team Members page, except that it only shows and adds team members who are assigned to the current event. Each team member record can be associated with a contact or user record. Users are people who work for your organization and have a Dynamics 365 license. Contacts come from your contact database, which will include customers, potential customers, vendors, partners, and other external people (or internal people who don't use Dynamics 365). When you create a new team member record, you'll be able to choose whether to associate it either with a user or a contact. If you choose to associate the record with a contact, the team-member record will display relevant information from that contact record. User records don't include any contact information, so if you associate the record with a user, the association will be shown but no additional information will be loaded. The team-member record also provides information about that member's role and which events he or she has worked on. You can create team members from either the Event Team Members list page or directly from a specific Event record. When you're looking at a list view of team members, the list includes both a User and a Contacts column, but only one of these will show a value. From the list, you can go to the user or contact record by selecting the name in the list, or you can open the team-member record itself by double-clicking on a row anywhere away from the person's name. The core attractions of your event offering will typically be its sessions and speakers. A simple event might have just one session, whereas a conference will typically have several sessions spread over several days. A session represents a subdivision of things that are happening at your event. Each session is usually a something like a seminar or keynote, but the concept is actually quite flexible so you can adapt it as needed. For example, if your event is a trade show rather than a conference, you can use sessions to represent booths. A large conference might have several sessions running concurrently, and might even feature several session tracks, which organize multiple related and non-conflicting sessions by audience so attendees can easily choose the best track for themselves without having to study the entire offering. Later, you'll be able up event and session passes to manage ticketing. There are two types of tracks: internal and external. Use internal tracks during the planning phase to group sessions along organization lines, such as according to team resources or required equipment. Use external tracks to group sessions by content or audience. External tracks are published on customer-facing platforms such as event websites and mobile apps. As needed, you can set up a pass type for each relevant external track, but you wouldn't set up passes for internal tracks. Use the Track Type setting, at the top of the form to set the track to internal or external. Use the Agenda tab of an event record to view and set up sessions and sessions tracks for that event. Each session is associated with a specific event and speaker, and includes scheduling details. Only live sessions and tracks are shown on the event website. When you're ready to go live with a session or track, open the relevant record and set its Publish status to live. For each track, you can assign an audience and a few other descriptive details and then add member sessions, one at a time. All sessions in a track must be from the same event. Events > Participants > Speakers: Lists all speakers who are available for previous, current, or future events, and lets you set up new speakers. Events > Event > Events: Work on the Agenda tab of the appropriate event record to set up speaker engagements for that event. You can also create new speaker records here if needed while setting up speaker engagements. A speaker record must exist. Event passes are essentially tickets that you can sell or give away to grant access to your event and/or its various sessions and tracks. Passes are optional, but if you want to use them, you'll start by setting up the basic types of passes that you need for an event and adding the applicable sessions to each of them. Later, you'll assign a pass of the appropriate type to each attendee by mapping each event registration to one or more pass types. Passes can also be shown on the event website, so attendees can register for the passes they want while registering for the event itself; in this case, the registration/pass mapping is made automatically. For each assigned pass, Dynamics 365 for Marketing generates a unique QR code, which you can print onto a physical badge that event personnel can quickly scan on entrance to confirm eligibility and record attendance. For each pass type, you'll set the event where it applies and then assign a category (attendee, speaker, sponsor, journalist, and so on), a price, an allocation (the number available), and other details. You can also assign a collection of one or more sessions for the pass, which grants access to all the sessions in that track, but not necessarily to all sessions at the event. For a simple event, you might set up just one pass type, which grants access to all sessions for all types of attendees. For a complex event, you might have passes for each of several session tracks, and might require specific pass types for accessing certain areas of the venue (such as a lounge just for journalists). Passes only make sense for physical attendees—you wouldn't set up passes for webinar-only attendees, events, or sessions. To view and create passes for an event, open the appropriate event record and go to its Registration & Attendance tab. You can view, edit, and create passes by working in the Passes area here. To add sessions to a pass, first create and save it here, then open it for editing and use its Eligible sessions tab to add sessions to it. You can add sessions to a pass individually or add an entire track at once. If you choose to add a track, all of the sessions that currently belong to that track will be added to your pass. However, when you add by track, you won't create a link to the track itself; instead, you just add all the sessions that currently belong to that track to the current pass. Future edits to the track won't affect the pass, so you must edit each existing pass specifically if you need to change the sessions that belong to it. When setting up a pass, pay attention to the Passes Allocated field, where you set the number of passes available, and its related fields: Passes Sold and Passes Remaining. Each time a pass is granted to an attendee, the Passes Sold number automatically increases and the Passes Remaining number decreases. When Passes Remaining reaches zero, that pass will be shown on the event website as "sold out" and will no longer be available for purchase by further attendees. If you set Passes Allocated to zero, that pass won't be shown on the website at all; you might do this for VIP passes, or to keep a pass as a draft until you're ready to publish it by setting Passes Allocated to a positive value. A venue is any physical location where you hold an event or session. It might be a single building with just one room, or one of several rooms in a building. For each venue, you can register many types of important details, including name, location, facilities, capacity, layout, events that will or have occurred there, and more. After you've set up a venue, you can assign events and sessions to it as needed. Use the various types of venue entities in the Events > Venue Management area to construct a hierarchical model of your event location. Later, you'll be able to assign events and sessions to each venue space from your model. You only need to include as much detail as you need, so a simple building with just one room doesn't need to have any rooms defined for it, and a simple room with just one layout doesn't need to have any layouts defined for it. But you can't set up a room without a building or a layout without a room. Events > Venue Management > Buildings: Buildings represent free-standing structures that might or might not be divided into rooms. Events > Venue Management > Rooms: Rooms represent subdivisions of buildings, and each must be assigned to a building record also stored in the system. Events > Venue Management > Layouts: During an event, you might use a single room to host several types of sessions, each of which might require a different arrangement of chairs and other facilities. The room layout might have practical consequences that affect, for example, seating capacity. Each layout must be associated with a particular room, but you can set up any number of layouts for each room.